How to download Hollywood MKV movies? It is difficult to tell differences between Dolby TrueHD and Dolby Digital 5.1, but actually Dolby TrueHD is different from Dolby Digital 5.1. I found lots of similar queries online, but many lack a proper answer. So here in this post, I will make a comparison between Dolby TrueHD and Dolby Digital 5.1. Part 1: What is Dolby Digital TrueHD Audio? Part 2: What is Dolby Digital 5.1? Dolby TrueHD is one of the first two lossless audio formats and codecs to become available only on high-definition optical media. For Blu-ray players and media, although Dolby TrueHD is an optional codec, it is widely supported. Dolby TrueHD uses the Meridian Lossless Packing (MLP) algorithm as the basis for its audio compression, which routinely achieves 2:1 compression rations. A Dolby TrueHD bitstream can accommodate up to 14 discrete sound channels, but in practice will carry either 6 (5.1) or 8 (7.1) channels. The standard supports bit depth of up to 24 bits, and data sampling rates of up to 192 kHz — for an uncompressed maximum bit rate of 63 Mbps — but for Blu-ray the current maximum is 8 audio channels at 24 bits and 96 kHz (or as an alternative, 6 channels at 24 bits and 192 kHz) for a maximum encoded bit rate of 18 Mbps. A search of available Blu-ray titles indicates that the current maximum is about half that amount: 6 channels at 96 kHz and 24 bit depth (which translates into a bit rate of 13.5 Mbps uncompressed, and 9 Mbps compressed). Dolby Digital 5.1 surround sound is the common name for six channel surround sound audio systems. 5.1 is the most commonly used layout in home cinema. It uses five full bandwidth channels and one low-frequency effects channel (the “point one”). Dolby Digital, Dolby Pro Logic II, DTS, SDDS, and THX are all common 5.1 systems. 5.1 is also the standard surround sound audio component of digital broadcast and music. All 5.1 systems use the same speaker channels and configuration, having a front left and right, a center channel, two surround channels and a subwoofer. Here is the most common speaker configuration for 5.1. Each black square depicts a speaker. 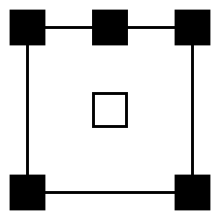 The centre speaker in the top line of the square is used for dialogue. The left and right speakers on either side of the centre speaker are used to create stereo sound for music and other sound effects in the film. The left and right rear speakers create the surround sound effect. Dolby TrueHD is a kind of quality-loss audio track, and it includes 7.1 surround sound and 5.1 surround sound. A 5.1 surround sound system uses 6 channels (feeding into 6 speakers) to create surround sound while 7.1 surround sound systems use 8 channels. The two extra channels of sound (and two extra speakers) provide a slightly better audio quality. Here I take 7.1 surround sound as an example to compare Dolby TrueHD with Dolby Digital 5.1. Supported by All DVDs, video games, etc. Industry standard PS3, PS4, Xbox One and most Blu-ray players, although only approx. >150 Blu-ray movies feature 7.1 sound. History Invented in 1976 by Dolby Labs. First used in theaters for Batman Returns in 1992 First theatrical 7.1 release was Toy Story 3 in 2010. Disney will use it for all future releases. Which Do You Prefer: Dolby TrueHD or DTS HD Master Audio?